It is widely accepted that getting divorced can be one of the most stressful time in a person's life. A divorce can also have an impact on children. The current law can force divorcing couples to blame each other for the breakdown of the marriage if they have not been separated for at least two years before starting divorce proceedings. Resolution and many family lawyers continue to lobby government for a change in the law. I have contributed to research into No Fault Divorce and believe that it could have a huge impact on divorcing couples and their children. Divorcing couples with children will need to continue to co-parent and communicate for several years and it is important that the law and lawyers give parents the best chance at moving forward in an amicable and sensible way. In a new poll, 79% of the population agreed conflict from divorce or separation can affect negatively children’s mental health, a figure rising to 87% among those who experienced their parents’ divorce as children. 77% said conflict could affect children’s academic performance and a further two-thirds felt social interactions and the ability to form healthy romantic relationships were also jeopardised. 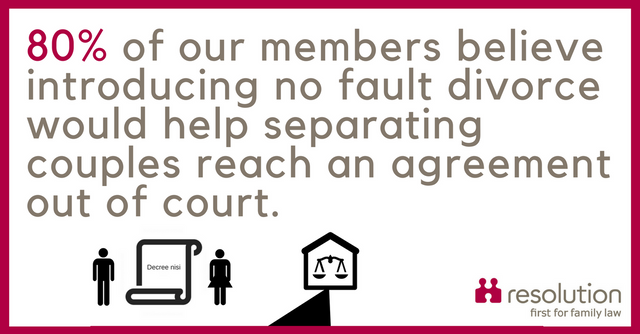 As 200,000 people divorce each year in England and Wales, an overwhelming 79% of the public support measures that would remove blame from the divorce process, with 71% believing change is urgently needed to reduce the negative impact on children. Earlier this week, @Auntie_Ag and @MissJoEdwards personally handed in our consultation response to @lucyfrazermp at @MoJGovUK.